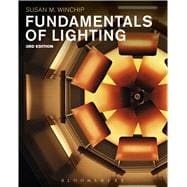 Fundamentals of Lighting, 3rd Edition, takes an integrated approach to the study of lighting and design. Topics include lighting system basics, lighting and the design process, human factors, sustainability, global issues, regulations, business practices, and the LEED building certification program. Fundamentals of Lighting STUDIO-an online tool for more effective study! PLEASE NOTE: Purchasing or renting this ISBN does not include access to the STUDIO resources that accompany this text. To receive free access to the STUDIO content with new copies of this book, please refer to the book + STUDIO access card bundle ISBN 9781501320927. Susan M. Winchip, PhD, LEED AP, MIES, is Professor Emerita at Illinois State University, USA.